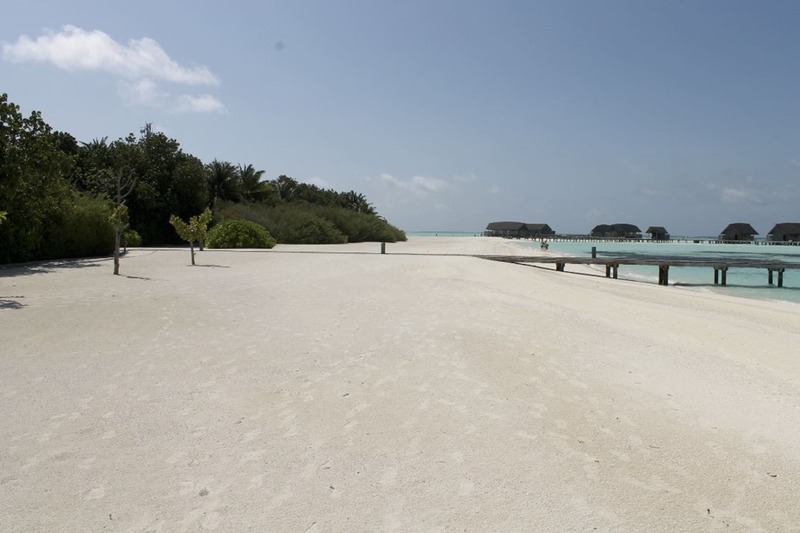 Sandbar-to-island ratio – It’s distinctive sand spit is not only one of the Maldives resorts’ longest at 1km (at ebb low tide), but with the only 350 metre island it makes it the highest ratio of sand spit to island quite easily. 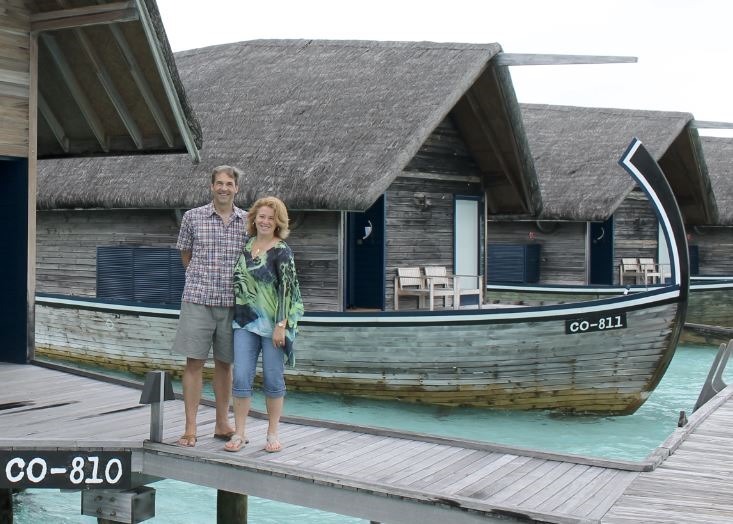 Guests to Resident Staff ratio – Cocoa Island is one of the most tranquil resorts we have ever visited. It’s not just that you don’t see many guests…it’s that you don’t see many staff. Or much resort infrastructure. It really is like a deserted island. They have a miniscule 150 staff (plenty to keep the place running smoothly and all your needs catered to), but less than 60 live on the island itself. Most live on local island 5 mins away. As a result, the island doesn’t have that buzz of activity with big staff quarters compound in the center of the island. In the land of endless water spectacles, Cocoa Island’s hydrotherapy pool might just be the biggest indoor water feature in the Maldives. 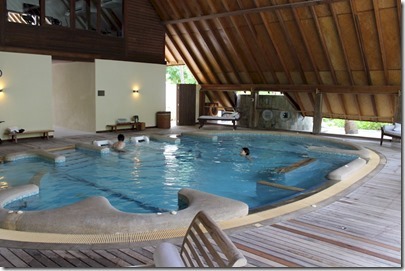 It certainly is the biggest hydrotherapy pool in the country, and in fact it claims to be the biggest in Asia. It’s the biggest I have seen and I am a connoisseur of spas around the world. 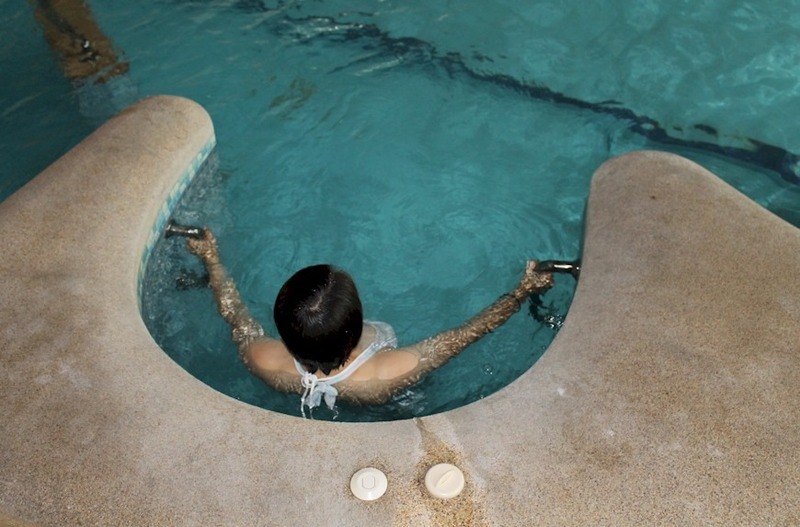 Even Lori was impressed as she uses hydrotherapy pools professionally as a part of her therapy practice. 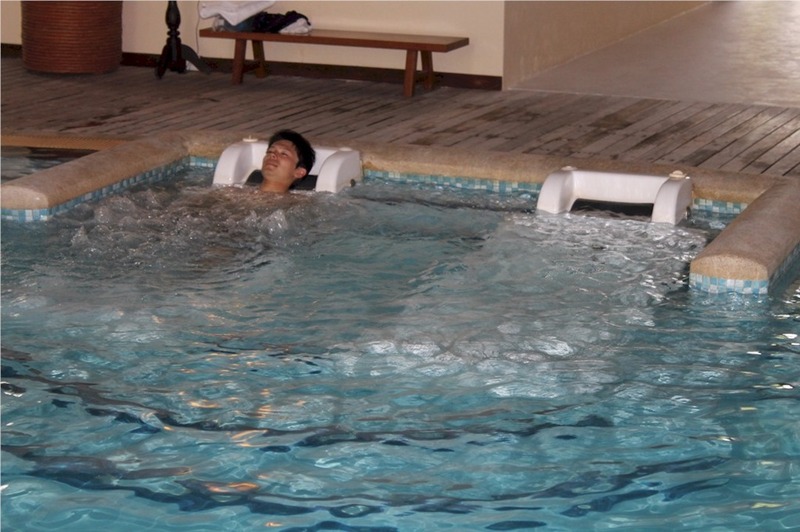 It includes bubble loungers, drench fountain, back massager and a whole array of relaxing water jets. It is available to all guests on a complimentary basis and fresh ginger tea is on tap non-stop. When is a resort not a resort? Cocoa Island resort doesn’t seem like a resort. No welcome sign. No adverts for activities. No bulletin boards. The island doesn’t seem like a resort island. It seems more like a sand bar with some palm trees on it. It has a very small operations hub in the centre of the island. Over half the staff don’t live on the island but commute from the nearby neighbour. The much smaller resort infrastructure makes it seem more like a little, exclusive community of beach houses than a resort. The resort common area buildings feel more like the community’s shared country club facilities. For such a small island it has such a big feel. The interior of the island is very sparsely vegetated so it has vast expanses of sandy ground shade by a dense palm canopy overhead (see top two pictures below). The entire interior is clear sand. But it is the exterior that really hits you. There is almost more beach than island (see second from bottom photo). Only Anantara Kihavah compares for an expansive wrap-around coral white beach. Kihavah’s is bigger because it is a bigger island, but Cocoa’s is deeper. And if a circumambulation isn’t enough, Cocoa is blessed with one of the longer sand spits in the Maldives that is actually up to 3 times longer than the island itself (see photo at bottom). Cocoa is definitely one of the quietest islands around. The much smaller resort infrastructure means there is less activity buzz in the foreground and less support buzz in the background. 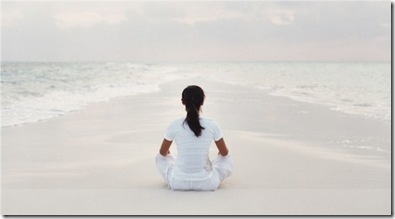 At times, I almost felt that I ought to whisper so as not to break the silence. The villas don’t feel like a resort villas. They seem more like an elegant beach cottages. Many of the villas are constructed with lofts which segregate the sleeping area. The living area below seems like a proper lounge. The lofts also give the villas an airy spaciousness. The windows extend a towering 15 feet up, and they surround you as 3 of the 4 walls provide expensive views of the aquamarine seas. I have anticipated seeing Cocoa Island for a few years now. One of the previous Ministers of Tourism recommended it to me as her favourite resort (she was a big fan of the Maldives Complete site). 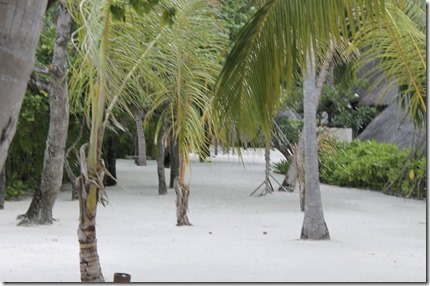 It also snared the TripAdvisor top resort spot in the Maldives a few years back. So expectations were dangerously high, and yet Cocoa managed exceeded them comfortably. 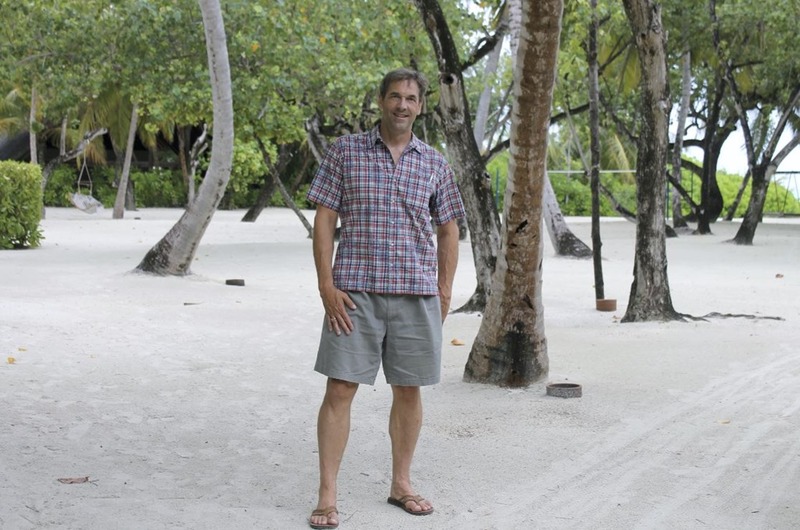 If you have a spare million and are considering buying a beach house that you might only get to a few times a year, I recommend putting the money in a bank account and drawing off it visit Cocoa Island regularly instead for a homey experience in the middle of true paradise. Instead of construction inspired from overseas, Cocoa Island features villas inspired from over the sea. These dhoni-inspired delights are the centrepiece of the all-water villa resort. 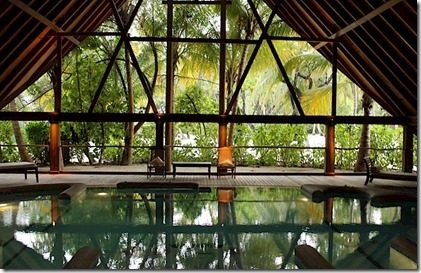 The design makes if one of the most captivating resorts. Cocoa was one of the top resorts recommended to me by one of the Maldivian government ministers on my last visit and it is regularly featured in distinctive hotel lists like “The 100 Most Amazing, Unique, and Beautiful Hotels In The World” (one of the best lists I have come across and has inspired a short Italy getaway for Lori and I next month). If you really want to poll for the best of somewhere to travel, then one of the most credible popular juries is TripAdvisor. No fees, no advertising bias, no select group. It is completely open to the entire world of travel and travellers. That doesn’t mean it is perfect. All sorts of biases can creep into any population sample and opinion gathering. But at TA is tops for structural objectivity. 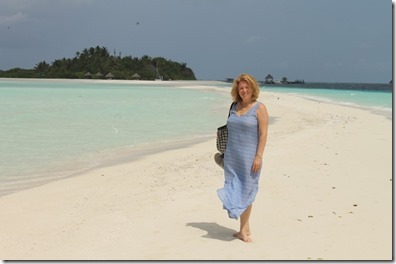 For some time, the top of the leader board for Maldive resorts is Cocoa Island. 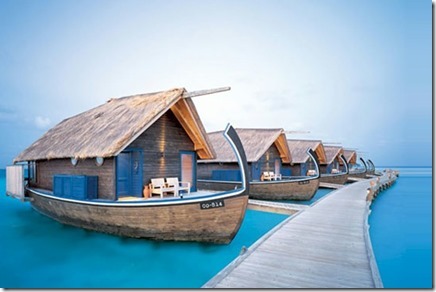 In fact, this year, Cocoa Island was rated one of TripAdvisor's top resorts worldwide for 'Luxury'. 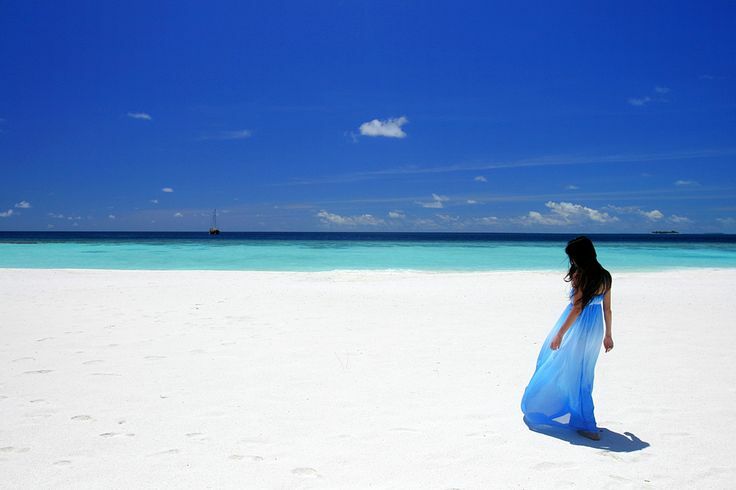 But as I say when people ask me my expert opinion on ‘Which resort is the very best resort in the Maldives?’, my response is, “There is no ‘best’…only the ‘best for you’.” It’s all very diverse and subjective. It’s like asking ‘what is the best ice cream flavour?’ That was one of my major motivations for developing the Finder page so people could filter the 100+ resorts based on the criteria that mattered to them. The Trip Advisor Traveller’s Choice Awards have been announced and the top Maldives resort was Cocoa Island, the only one featured in their 10 lists. 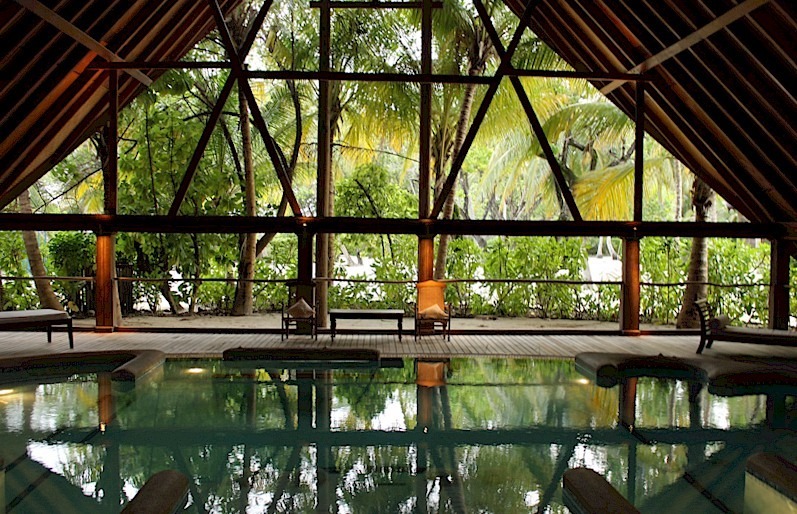 It came in #5 in the ‘Top Luxury’ resorts worldwide (wresting the title from last year’s honoree Angasana). A well deserved honour, it would seem, given the very recent report by Francis where he described it as bringing him to tears. 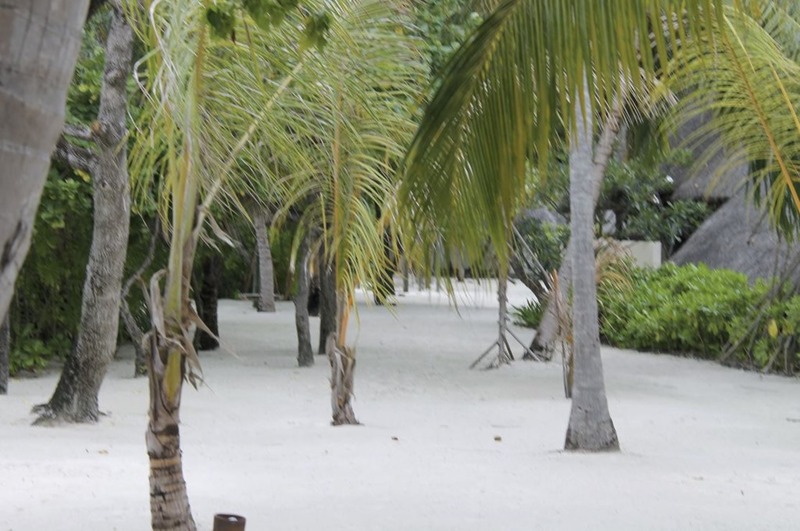 Just to top it all off, Cocoa Island also tops Trip Advisor with the highest review ratings of any Maldives resort. It just gets easier and easier to work on Maldives Complete because more and more visitors are kindly writing to me with help, suggestions, missing information, corrections. But one individual stands above all his ability to ferret out the most esoteric and obscure details – Francis Negrin. 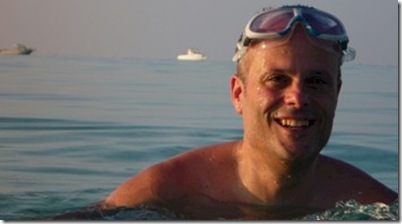 He has identified new islands, quirky features, and buried website troves of tidbits. Sometimes I actually have come across some of these things and I think he finds it fun sport to see if he can uncover something missing in the Maldives Complete collection. We also have good chats about all sorts of Maldives topics. 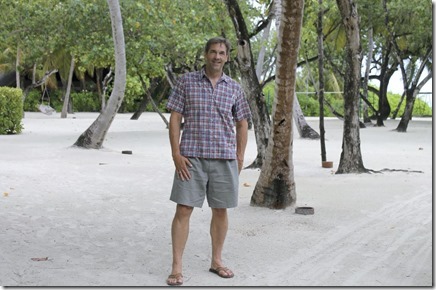 And if his current trip is any indication, he stands out in his adoration of the Maldives. Many people feel blessed with one week in the Maldives though if budget and holiday time permits so many people prefer two. Francisco and his friends are going for an entire month during which include Rihiveli (“truly stunning and very very cheap. A gem . The rare find . 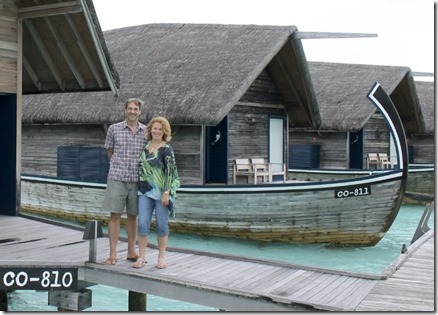 Way way better than any resort at that price range except there is no house reef”), Cocoa Island (“Cocoa is stunning. I even cried a bit when i got here.”), Dhoni Island, (excursion to Athuruga from there) , Alila Villas Hadahaa, Kanuhura, and Anantara Kihavah. To add to his long collection of contributions, the Cocoa Island profile is now 100% complete thanks to his snapping me a picture of the fitness centre that I have just loaded up. You too can follow along (if you can tolerate the envy) at his photo-blog http://gallery.me.com/fnegrin#100179. Master Adrian’s enlightened opinion is good enough for me.